"The Iron Curtain and the Bamboo Curtain would be less dangerous if there were more wagons crossing over them carrying goods from one side to the other. Trade increases understanding." In the 1950s he led a delegation of British companies at a multinational economic conference in Moscow. During that trailblazing mission the British delegation began historic talks with representatives of the New China government. Those early talks helped kick-start East-West trade during the then ‘Cold War’. In 1953 Lord Boyd-Orr, who went on to form the British Council for the Promotion of International Trade (BCPIT), took 16 representatives of British companies, including Jack Perry, to China to discuss trade. The 1953 ‘Icebreaker Mission’ paved the way for the now fabled 1954 trade mission with 48 businessmen from British companies, which later became known generically as The 48 Group – The ‘Icebreakers’ and whose trail-blazing initiatives have become a long time part of British-Chinese history. The motto of the 48 Group Club is ‘Equality and Mutual Benefit’ and it echoes the words of Zhou Enlai, China’s much-respected Premier from 1949 to 1976, who first used that phrase in 1953. Over the ensuing years, this commercial group, funded by its members, grew to be the most respected name in China-Britain trade, a name well known throughout China. The Group provided support and consultancy services to British companies entering China’s markets. In the late 1980’s the 48 Group – The ‘Icebreakers’ merged with the Sino-British Trade Council to form the China-Britain Trade Group, now known as the China-Britain Business Council (CBBC). Today’s 48 Group Club – ‘The Icebreakers’ – which has grown to over 500 members continues to develop the work of promoting positive Sino-British relations. 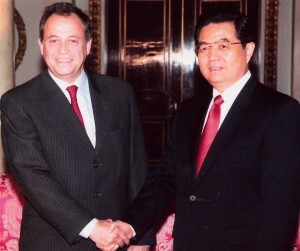 The concept was developed from an exchange of ideas between Premier Wen Jiabao and club chairman, Stephen Perry. Premier Wen said: “The rewards from such exchanges will be inestimable for both our countries.” During his visit to London in January 2009, to attend the annual UK-China Summit, Premier Wen met members of the ‘Young Icebreakers’ to hear their views and encourage their enthusiasm for forging ongoing and further bonds of friendship between the two nations. Indeed, the 48 Group Club is still regarded an important means of maintaining a network of those in Britain active in China trade, academic and cultural exchanges, and maintaining a well-regarded relationship with Chinese friends. The Club’s name continues to be held in high esteem by the Chinese government and significantly by the younger generation of Chinese entrepreneurs and those involved in the increasing cross-cultural activities. The Club now has over 600 British and Chinese members, including senior executives from corporate organisations involved in trade and other dealings with China, as well as high-level politicians, diplomats, academics and others focusing on cultural relations. The Club offers an important – and often key – network of contacts (guanxi) for those active in building relations through any field from commerce to culture. Club members believe they have a vital role in helping to reduce the cultural deficit between China and the rest of the world. "The 48 Group Club has earned a special place in the annals of international trade history – the first Western group to open trade with the new China. When Gordon Sloan returned from his visit to China with Roland Berger in the first half of 1958 he reported to a General Meeting of the Group that: ‘Of one thing there was no doubt – the extraordinary prestige which the ‘48’ Group had acquired as a result of the visit last year of the Chinese Economic and Technical Mission. During his visit he had found that everywhere he went the reputation of the Group stood very high. The spread of the mystique of the ‘48’ Group – (Ying Guo Si Shi Ba Jia Ji Tuan) – can be dated from around this time." Extract from Percy Timberlake’s book ‘The Story of the Icebreakers in China’ published in 1994. Percy Timberlake was one of the original 48 Group of businessmen: he died in 2004. 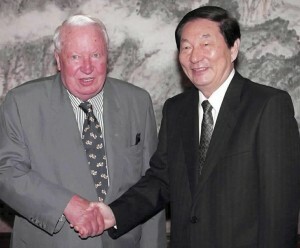 Centre is Chinese Premier Wen Jiabao, visiting the UK in 2004, and pictured with, amongst others, the late Percy Timberlake who was one of the founders and later Vice-President of the 48 Group Club. Next to him is Luise Schafer, former Vice Chair of the 48 Group Club, and who now is based in Shanghai. The current Chairman of the 48 Group Club, Stephen Perry, is pictured on the right of Premier Wen. 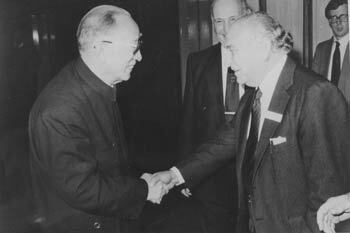 VETERAN OF THE CHINA COUNCIL FOR THE PROMOTION OF INTERNATIONAL TRADE, BO YIBO AND JACK PERRY, GREET EACH OTHER IN BEIJING. ‘Equality and Mutual Benefit’ or in Chinese ‘Pingdeng Huli’, the motto of The 48 Group of British Traders with China, echoes the words used by Zhou Enlai, China’s much-loved Premier from 1949 to 1976, who first used the phrase in public in 1953. Veteran of the China Council for the Promotion of International Trade, Bo Yibo and Jack Perry, greet each other in Beijing. Veteran of the China Council for the Promotion of International Trade, Bo Yibo and Jack Perry, greet each other in Beijing. He was setting out China’s ‘Five Principles’ of cooperation with the outside world to a visiting Indian delegation. By taking up such a principle from its earliest days (today we’d call it a mission statement), The 48 Group demonstrated how closely it would follow and seek to understand China’s developments. In this way it would try to match China’s development needs by introducing relevant British companies and their products to the market. This was often in the face of adversity and always with limited resources. As a result, Britain and The 48 Group earned a special place in the annals of international trade history – the first western country to open trade with the new China, on a platform of mutual respect. The strength and success of the Group and its forerunners were not financial, but lay in the work of a few visionaries such as Jack Perry, Tod Sloan, Roland Berger, Percy Timberlake, Professor Joan Robinson and the British companies which formed its membership – a mutually supportive network. Equally important was the very close relationship with Chinese counterparts, for example the China Council for the Promotion of International Trade whose Chairman, Bo Yibo became a firm friend. 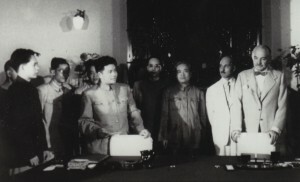 As a privately constituted body which had led the campaign against the British government’s embargo of trade in those earliest days of the new China, the Group had no recourse to public funds, nor did this trouble them. By working directly with and for British industry they could keep their agenda sharp, pertinent and flexible to changing needs. To keep up with China’s modernisation agenda it was always important to ensure Group events were relevant to the membership. By focusing on China’s requirements and introducing specific technologies / products in a timely and effective way, British companies were ensured an excellent chance of winning business and Chinese customers were satisfied – often returning for repeat orders because trust and quality had been established. The small number of importers in the Group were just as active as the exporters and gave China a chance to earn hard currency with which to buy further British goods – a virtuous circle was created and for many years Britain led the trade with China among western countries. This was long before China became the very popular business destination and major economic power that it is today. It took determination and hard work, but bilateral trade increased dramatically over the years so that Britain was China’s premier western trade partner up until the late 1970s. Companies joined, left and re-joined the Group, but membership always grew steadily as business took off. By the 1980’s when China’s opening-up reform programme started, Germany, the US and others began to go to China in greater numbers. New challenges faced British industry. Without official government backing, the hostility directed at those who wanted to open trade with the new China cannot be underestimated and many personal sacrifices were made. The hard-won breakthroughs were worth it in the end; the pioneers foresaw China’s huge potential, they envisioned a world where China could take its rightful place among a community of peaceful trading nations, and predicted the benefits that would accrue to both Britain and China. Largest display of western equipment ever to be held in P R China until then. 48 Group recognised as ‘most potent force’ in bilateral trade. ‘Working Party’ on technology transfer, buy-back, production know-how, presages China’s new economic plans to attract foreign technology and investment. Activity generated by 1989’s mission continued for months afterwards and two missions visited various provinces again in the autumn of 1990 to continue business. Meanwhile, discussions began on a proposed merger with the Sino-British Trade Council to combine resources and effectiveness in trade promotion with China. The China-Britain Trade Group was born in January 1991 to continue the advisory and promotional work. The 48 Group Club* was formed later that year to maintain the spirit of the original pioneers. An informal and friendly outlet for networking and social contact between people from business, cultural, diplomatic and academic circles, the Club was established for anyone with interest in and association with China trade. The Club’s motto provides a fitting continuity between the pioneers and the new generation – ‘Equality and Mutual Benefit’. Written with a debt of gratitude to Percy Timberlake from whose history of The 48 Group the substance of this article is taken. To enquire about the book ‘The 48 Group – A History of the Icebreakers in China’ please contact us.